This is a super easy salad that you can make for lunch. It’s fast, easy, filling and good! For the best flavor, add the salad dressing right before serving. This salad can also be served as a sensational summer side dish. Just double the ingredients accordingly for the amount of people it needs to serve. For this recipe, golden raisins were used. 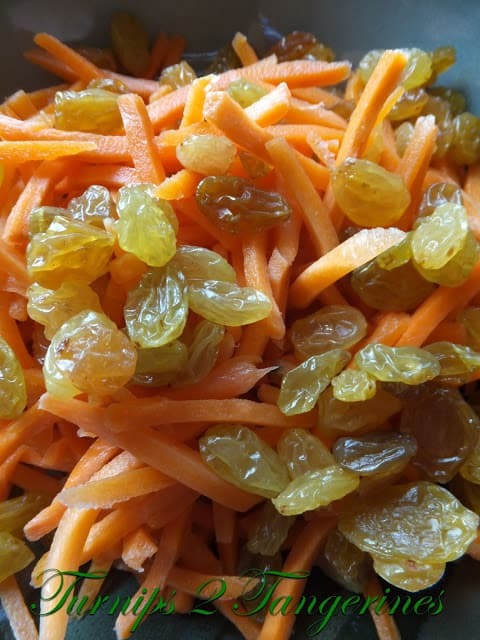 Golden raisins are plumper therefore work best in salads, in our humble culinary option. 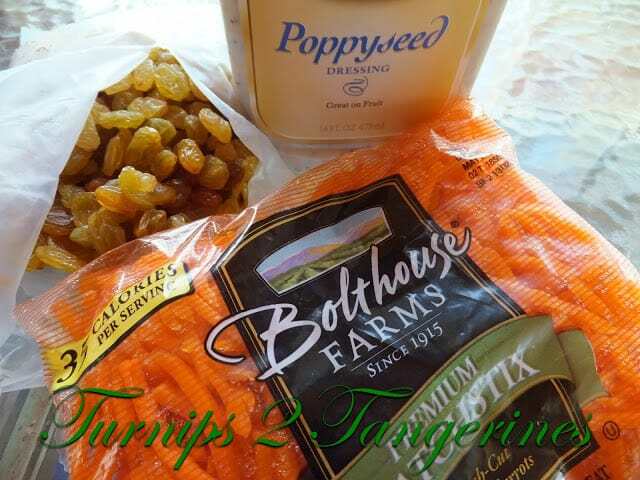 For this recipe we went with a bottled poppy seed salad dressing. 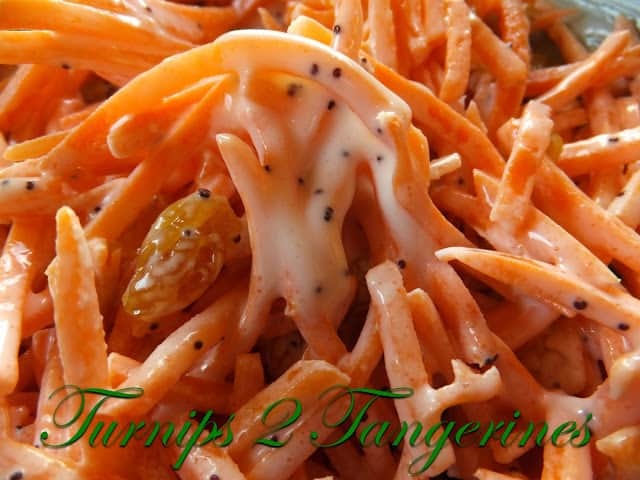 Our favorite bottled salad dressing and the brand we use most often here on Turnips 2 Tangerines is Mazaretti Salad Dressings. You can easily make your own ‘from scratch’ poppy seed dressing if you’d rather not use a bottled dressing. There are many brands of poppy seed dressing to choose from. Use the brand that you and your family likes. This recipe makes enough for 2 people or one depending how hungry you are. 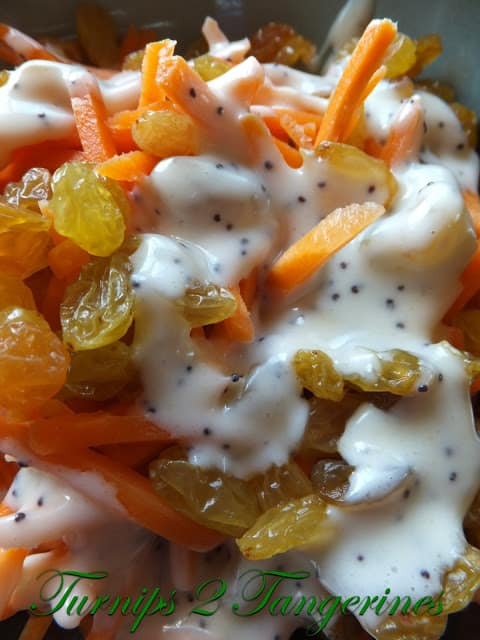 But easy carrot raisin salad can easily be doubled, triple or quadrupled, depending on how many people you need to serve. 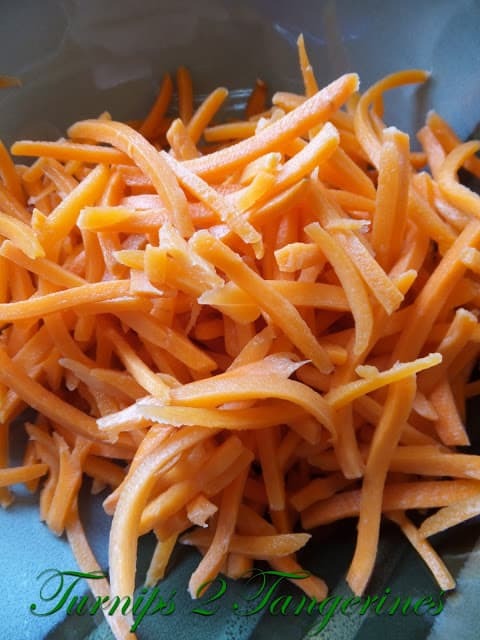 Another thing I like to do when making this salad, is when fresh carrots are available at the farmers market or farm stand I frequent, pick up some fresh carrots, make this salad and taste the difference using fresh carrots has to offer. This salad will take on a whole new taste when using fresh carrots. When using fresh carrots, this would be a good time to employ the help of your hubby or significant other. If he or she owes you a favor, now is the time to call in on that favor. (Tell them you’ll peel, if they shred/grate) Give hubby/wife/significant other the job of shredding the carrots. I still use the old box grater and have “grated” the skin off of my knuckles more than once. So if you’re like me and still use that old nasty box grater, call in that favor. Your knuckles will thank-you for it! Sweet Spicy and Sour Pulled Pork is reminiscent of a sandwich I had while visiting North Carolina a few years ago. This looks so yummy and healthy! My daughter and I love carrots. Can't wait to try it. Just pinned. Thank you so much for sharing at A Bouquet of Talent. Hope you are having a great week. What a great, quick & easy salad for summer. I like the poppy seed dressing. Thank you for linking!